“Is This Thing On?” Navigating the Digital World – The digital divide widens with the rapid pace of new innovations and gadgets. What is out there and how it might benefit you can be lost in all the tech talk. Should you buy a tablet or a computer? Stick with your PC or move onto an Apple? How do you maximize your searches and why on earth do people want to share on Facebook? Abby helps “digital immigrants” (those baby boomers and beyond not born with a keyboard and mouse in hand) understand what everyone is talking about and how to decide what might work best for them. 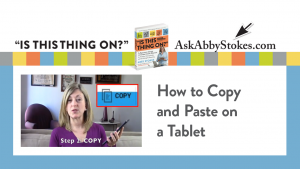 How to be Smart with your Smartphone and Tablet – Abby introduces you to the basics of how to enjoy your smartphone and tablet. 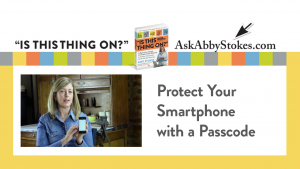 You’ll learn how to protect your device with a passcode and save the battery life. 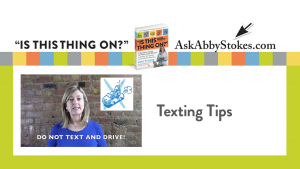 You’ll discover out how to text and what on earth an emoji is along with the an introduction to the calendar, alarm, camera, GPS features and where to customize the settings. We’ll also discuss downloading apps, music, and books. Learn a few tricks to show your grandkids! Tech Travel Tips, Best Travel Apps, and Great Travel Gadgets – Are you planning a trip soon – maybe out of the country or just across state lines? Abby talks about precautions you should take so you don’t come home to a smartphone bill th at’ll ruin your vacation after-glow. Learn about what great apps there are for your smartphone and tablet to help plan, navigate, and enjoy your trip. She has also handpicked some particularly helpful gadgets to make your travels easier and more streamlined. Abby Stokes, author of “Is This Thing On?”, will explain what everyone’s talking about when they bring up Facebook, Twitter, and other social networking sites. She’ll also share how you can enjoy the benefits without risking the loss of your privacy. Good Computer Habits: Ergonomics, Netiquette, and How to Make a Difference – Abby will discuss online netiquette for e-mail and blogging, tips on how to be sure you’re not hurting yourself when on the computer, and how to do good deeds with a click of the mouse. There’s an App for That – What is an app and how do you add them to your smartphone or tablet? There are apps for entertainment, apps for education, and apps that allow you to monitor the utilities in your home. We’ll discuss those along with the best apps for travel, news, health, and weather. 10 Tips for Teaching Silver Surfers – For those computer users in the know who might be teaching computers to new members. There are unique obstacles to teaching technology to a generation that not only wasn’t born with a computer mouse in their hand, but clearly remember when telephones were rotary dial. There are three motivating factors that inspire most silver surfers to take on the challenge of the computer – the Internet, e-mail, and a desire to not be left behind. Keeping those three objectives in mind, Abby shares her 10 tips on how to successfully bring the computer fearful on board and enjoy all the Internet has to offer. Purpose and Fulfillment in Mid and Later Life: Can It Be Found Online?